The Birth of Saudi Cinema! Shadows of Silence (Abdullah al-Moheissen) has been shot in the desert and is about the lives of a number of politicians and scientists, who almost live in captivity at a half-closed place and are having a difficult time. They try to escape from that place. The film runs for 108 minutes and has been made by the youngest director of Saudi Arabia who is 30 years old. Akira Kurosawa, the grand master and one of the main pillars of the history of the world cinema, had said about Satyajit Ray that “Not seeing Ray’s films is like having lived on the Earth without seeing the Sun or the Moon.” The first time that the great Indian filmmaker was introduced to Nantes Film Festival was the first year of the festival; that is, 1979, when he was lauded by the great French critic, the late Serge Deney, who also analyzed his works. This time, at the 28th Nantes Festival, Jalladeau brothers (Alain and Philippe Jalladeau) and other managers of the festival, arranged the most comprehensive review of his works in the west, which was enthusiastically welcomed by people and film critics. He was born in 1921 in Mumbai in a family that was familiar with literature and culture. 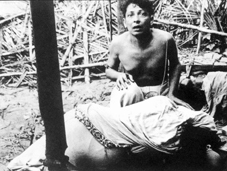 Ray made his first film, Pather Panchali, in 1955, which won a prize at Cannes in 1956. Before that, he was assistant to Jean Renoir in The River, which was made in India. He was also awarded an honorary Oscar in 1992 for his works before dying in April of the same year. A new section has been added to the festival over the past few years in which filmmakers and producers from three continents introduce their screenplays and plots to the head office of the festival. After some of them are selected, film distributors, especially Europeans are invited during the festival to go to Nantes and invest in suitable plots. This is a new mission for international festivals. During the current year, eight out of 80 plots were accepted and reviewed in two days in presence of the European distributors. The accepted projects came from South Africa, Argentina, Chile, Mauritius Islands, India, Indonesia, Kyrgyzstan, and Mexico. Afterwards, producers proposed that their selected films be screened in the festival. Through the Olive Trees was among the eight selected films. The film had also been screened in the festival many years ago (in out-of-competition section) and had been appreciated. This time, enthusiasm was more and Kiarostami was introduced as one of the most prominent cinema masters of three continents. The problem of finding suitable and firsthand films is nagging festivals year after year even now that six thousand films are produced every year. No other time in the history of cinema, has so many films been produced. One can claim that as many HD cameras, which are produced by various companies, filmmakers have emerged. Let’s have a look at 13 long narrative films and seven long documentary films, which took part in the Competition Section. Opera Jawa (Garin Nugroho) from Indonesia attracted me more than any other film. It was an adaptation from a famous folkloric tale, which was first performed as an opera and now the creative director has mixed everyday life of people with opera. The director offers a clue to viewers from the very beginning and if they understand that clue, the film will take viewers with it just like a ship on a calm sea or like the magic carpet. The film is an intelligent mixture of music, color, words, as well as poetical description of an unusual and fabulous loving couple. Tales of such couples have been told and recounted since the beginning of history, but every time, they had been told in a new language and a new form. Sitio and his wife Siti are working at a jar making workshop when the jar and its maker are so assimilated in each other that the heart of the woman becomes one with the soul of her husband. All colors, people, walls, the space and time at the small village where the story happens, mean to serve the relationship between the lover and the loved one. Sentences, poems, and rhyming words give a profound meaning to every scene of the film. In that village, the big, powerful and cruel butcher controls all activities in the market. He is also in love with the wife of Sitio. This is a powerful and attractive film and draws the viewers into the core of this pleasant opera, encouraging us to look forward to seeing his next works. Garin Nugroho, is 45 years old and has started filmmaking since 1980s. He has made a lot of documentary films. Firework Wednesday, made by Asghar Farhadi (one of the most promising directors of the Iranian cinema) is different from other films. His film was welcomed in Iran both by viewers and critics and has also been hailed in international film festivals. This film, which barely missed last year’s Cannes Film Festival, is different from other films that have thus far been appreciated outside Iran. During one day, various aspects of everyday life of an urban couple are analyzed through an excellent screenplay and the resulting suspense makes the viewer to follow the film to the end. The details of the film and the well-thought scenario are major factors that promote the film’s story and help us identify its characters and social circumstances. Such delicate details can be seldom found in an Iranian film. Add to them, impeccable stage design and good performances, which have given birth to a consistent, laudable film, which is liked both by ordinary and fastidious viewers. In A Few Kilos of Dates for a Funeral, made by Saman Salour from Iran, the power of pictures, striking mise en scène and a different theme have come together to make a good artistic film. The film’s rhythm is as it should be. The screenplay includes many more elements and details than his first film. Of course, foreign sale of the Iranian films and other films made in the three continents has become increasingly difficult. A Few Kilos of Dates for a Funeral could have been easily sold 10 years ago. However, if a country buys it now, everybody will say this is a miracle and we hope that miracle will take place. Anyway, such films have always been made, and should continue to be made, in various countries. It is like a small brook which flows along a big river and should be supported. Martin Scorsese once said that he greatly likes such films. But he makes action, big, star-studded films on the basis of very professional screenplays for massive audience. Have you watched his first film, The Departed? This year’s films were superior in quality compared to those that were screened over the past few years. Out of other films, one can single out the Argentinean film Meanwhile (Diego Lerman) which focuses on bits and pieces of people’s lives in Buenos Aires (three Argentinean films took part in the competition section) as well as Born and Bred (Pablo Trapero), which has made in Argentina in cooperation with some other countries, and Rain Dogs (Ho Yuhang), from Malaysia. In the competition section for documentary films, seven long films took part including Exterios, the first film made by Alireza Rasoulinejad, from Iran. It is evident that the director has been influenced by Jean-Luc Godard and Woody Allen. The narration and make-up of this semi-documentary film is mixed with comedy. Seven judges of the festival, who came from the United States, Portugal, Romania, Germany, Britain, and Georgia, had a long debate about the prizes around the lunch table on Tuesday, November 28 and finally…. In a competition, enthusiasm, the sweet taste of winning, bitterness of losing, pity, anger, happiness, anxiety, disappointment, regret and even tears and cries can usually be seen hand in hand. When the announcer declares the names of winners, the whole world of a filmmaker changes: an auteur is born while another director, who has not won a prize, may collapse internally. Competition means winning and losing; it is a game and its rules should be accepted. • The best prize for a documentary film was won jointly by the Brazilian film, Acts of Man (Kiko Goifman) and the Taiwanese film, Yellow Box (Huang Ting-fu). In this way, Iran won the fifth grand prize of the Festival of 3 Continents. Amir Naderi and Abolfazl Jalili had already won the prize; two times each.